Found in Jambi Province of Sumatra at elevations around 1800 to 2200 meters as a small sized, cool to cold growing epiphyte with a branched rhizome giving rise to cylindrical, 5" [12.5 cm] between each pseudobulb carrying a single, apical, erect, elliptic-lanceolate, abruptly narrowing .8" [2 cm] below the apex, shortly petiolate base leaf that blooms on a slender 2" [5 cm] long peduncle, arising on a newly emerging growth, rachis arching to 4" [10 cm] long, laxly many flowered inflorescence. 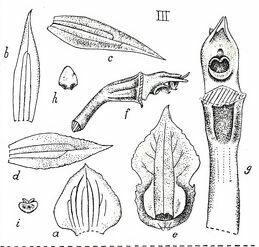 J J Smith compared this species to D latilobum but D decipiens has larger flowers, very acute sepals and petals, a longer lip, with the large basal part as broad as the mid-lobe, longer and lower keels,. a straighter column, and the nearly linear stelids that are longer than the column.